Q: The sound quality and performance of M&D® speaker is definitely dazzling to me; however, the HF end is somehow different from the best speakers I’ve heard, not insufficient but less of “richness” to harmonics. Why is that? A: The conventional dome tweeter has a wider dispersion angel for high frequencies, listener hears music not only directly from the tweeter but combining with many indirect bounces from wall, ceiling, and floor also. This property gains the richness feeling to HF harmonics therefore. 1) The Dreams AMT wideband driver has a higher transit response characteristic over the conventional tweeters. Which means, Dreams does not only responding to music faster, but also stop faster (less of “ringing” over conventional tweeters). In good side, it is more transparent to music reproduction; on the other hand, listener may feel “thinner” to the HF end due to the shorter responding duration. 2) The air motion mode implemented by Dreams has a high directivity characteristic in natural. Our curvy design to Dreams wideband driver can ensure a ±30º dispersion from 700Hz up to about 8KHz; for frequencies higher than 8KHz however, the emitting power is more focusing to the centerline that directly points to the listener, less of (indirect) reflections can be heard to the case. These factors caused a different way of sounding to the very high frequency end, a swift responding with higher directivity in property compares to the conventional dome tweeters. Dreams does provide a more transparent reproduction with better resolution and transit response characteristics. This high fidelity in natural may be more appreciated by the professional audio engineers for studio application; yet may not please to every audiophile to satisfaction. There are two possible solutions to gain the indirect scattering so giving you a “richer” spatiality to the very high frequency end. A simple way you can try it, is to place the M&D speakers with a longer distance to listener in between, and add some furniture two side walls so having a chance to hear more acoustic reflections by this deployment. 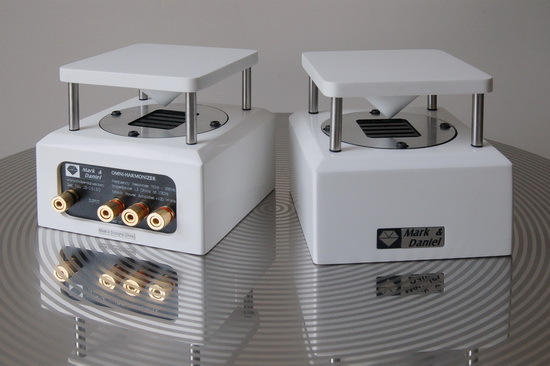 Another solution is, to apply an acoustics diffusive device to gain more reflections to the very high frequencies; that is exactly what M&D®’s Omni- Harmonizer does.